Plants had to solve a problem: they needed to find ways to spread their genetic material. Flying pollinators, insects, birds, and bats—were nature's solution. Nectar is made as a reward for pollinators. They need the plants in order to survive because nectar is their food source. Not all plants produce nectar, only plants that are visited by animal-type pollinators. Plants that are wind pollinated, for example, will not produce nectar. The main ingredients in nectar are natural sugars in varying proportions of sucrose, glucose, and fructose. In addition, nectars have a variety of other chemicals. Nectar also contains water, carbohydrates, amino acids, ions and numerous other compounds. Plants use the energy in sunlight to make sugar from carbon dioxide and water -- the process that's called photosynthesis. Most of the sugar is made in the leaves, the plant organ that is specialized to gather sunlight. From the leaves this sugar travels through the plant's conducting tissues to the other parts of the plant, the roots, stems and flowers. These plant parts then remove the sugar from the conductive tissues and use it to fuel all their metabolic processes. 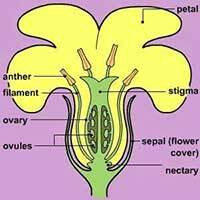 A nectary is a nectar-secreting gland found in different locations in the flower. The different types of floral nectaries include 'septal nectaries' found on the sepal, 'petal nectaries', 'staminal nectaries' found on the stamen, and 'gynoecial nectaries' found on the ovary tissue. Nectaries can also be categorized as structural or non-structural. 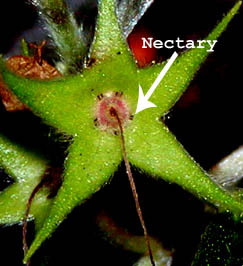 'Structural nectaries' refer to specific areas of tissue that exude nectar, such as the types of floral nectaries previously listed. 'Non-structural nectaries' secrete nectar infrequently from non-differentiated tissues.